Two amusing stories caught my eye recently. 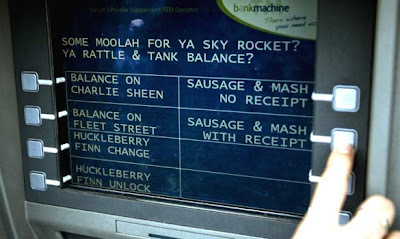 The Times Online is reporting that some ATMs in London are showing Cockney Rhyming Slang instead of standard English. Wonder what the tourists will make of that one? The second story concerned "putpockets." Apparently, some former pickpockets have been consumed with guilt over their former activities. To make amends, they are now going around London PUTTING CASH IN random pockets and bags. According to the story, the activity will soon spread to the rest of the country. Hmmm, let's just hope unrepentant pickpockets aren't trailing the "putpockets" and relieving people of their surprise cash! Hi Lisa, I like your site! Maybe I should book a trip to England right now, leave my bag lying around once I get there, and see if I can pick up some extra cash! And since you like all things British, you might be interested in participating in a live online chat with Hugh Laurie tomorrow (click on my username for more info). Thanks for entering my Stieg Larsson contest. Thanks for the heads up on the chat! Always glad to find more info about British celebrities!